Chiller/HVAC tubesheet coating can provide a solution to your cooling water corrosion problems. 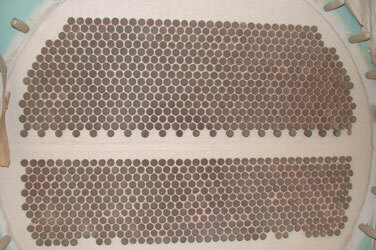 Typical problems arise at the tube to tubesheet interface, often as a result of dissimilar metals and galvanic attack. For years Curran International has provided technicians and epoxy polymeric coating systems to repair and protect mild steel tubesheets, and marine boxes (channels). Curran 500 is an advanced two part 100% solids epoxy (0 VOCs) with versatile formulations to satisfy a range of application specifications. It can be used as a brush or roller applied liquid film, encapsulating corroded substrate with a homogeneous protective film. A paste grade repair version can be clad to 250 mils total DFT; and the use of tube forming plugs enhances the inlet flow of cooling water while giving steel tubesheet years of reliable service. The Curran 500 system has been used for all cooling water services to protect chiller tube sheets, water boxes, marine boxes, channels and circulation piping. Curran provides turnkey applications, and our site containment methods meets expectations of building maintenance protocols at institutional,office building, educational, governmental and medical institutions. 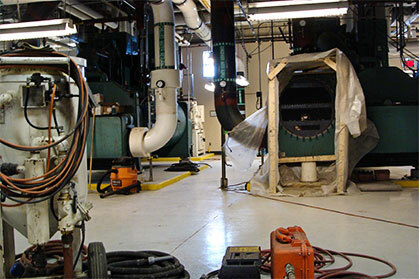 Curran coatings have been used for major OEM chiller restorations from 300 to 2500 tons units. Curran 500 chiller/HVAC coating provides a barrier to corrosion and mitigates tubesheet degradation and leaks to maintain the integrity of condenser vacuum performance and operational efficiency. Taking a proactive approach by coating your chiller tubesheets promotes years of maintenance free service. The coating is durable and can sustain routine tube cleaning and tubular ID NDE probes. Curran provides turnkey applications with our site containment dust vacuum system which facilitates application at institutional, office building, educational, governmental and medical institutions. Curran coatings have been used for major OEM chiller restorations for all classifications of commercial and institutional HVACs. Curran has a branded product program for HVAC maintenance companies and industrial applicators; coating kits are available for shipment from Houston. Contact Curran for a coating material quote.